Created by principals for principals, Pivot with 5D+ enables administrators to collect and code evidence from observations, conversations with teachers, student work, and artifacts in order to complete mid- and end-of-year formative and summative evaluations in a totally mobile and paperless environment. Pivot with 5D+ provides a simple, efficient and effective platform for principals, assistant principals and instructional coaches to collect evidence of classroom practice based on the inquiry-based growth model of the 5 Dimensions of Teaching and Learning™ and the 5D+ Teacher Evaluation Rubric. 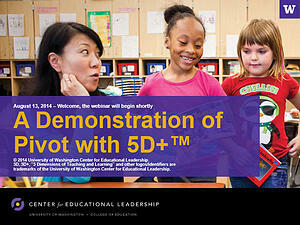 Pivot with 5D+ (formerly 5D+ GoObserve) was developed through a joint partnership between the University of Washington Center for Educational Leadership and the Michigan Association of Secondary School Principals, and is maintained and supported by Five-Star Technology Solutions. This webinar is presented by Pam Winders, a trainer and product specialist with Five-Star Technology Solutions. Pam Winders has over five years of experience implementing and supporting technology in K-12 education. While working at Cloverdale Community Schools in Cloverdale, IN as a certified technician, she managed over 1300 computers and wireless devices and trained staff on multiple software programs. She currently specializes in training administrators, teachers and technicians on Five-Star Technology Solutions Pivot software via webinars and on-site training sessions.